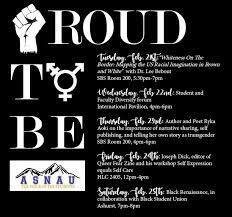 So, this February, I was at Northern Arizona University. I had an excellent time–but gosh, it was my first reading after the election (I chose not to attend the AWP–more on that in another post). I was struck by how resilient and brave the students and the faculty at NAU are–but stunned that at a time when we should be celebrating and nurturing our best and brightest, we are forcing them to fight for their identities, their voices, and even their safety. This is not an indictment of a school, or a locality–but a bigger problem we seem to have as a country–why do we distrust our young? Why do we see them as competitors, as other–when they should be seen as our legacy? As a teacher, this simply befuddles me. But, yes, the students at NAU, and the faculty, and the people I hung out with… I was treated with so much kindness and gratitude. And I return that. Thank you so much! Next Post Returning from Iceland!